What Do Meteorologists mean by “Normal”? a. conforming to a standard; usual, typical, or expected?. b. a line, ray, or other linear feature intersecting a surface at right angles? c. a town in Illinois? d. none of the above? Most users get that “normal” is some kind of average, but climatologically it is a very specific average. “Normal” is defined by the World Meteorological Organization (WMO) and its member nations, including the United States, as a 30-year average of a weather element (i.e., temperature, rainfall, wind, etc.) that is recalculated every decade (http://www.wmo.int/pages/prog/wcp/wcdmp/GCDS_1.php). The current “normal period” is the 30-year period from 1981 through 2010 and next one won’t be until data is in for the 1991-2020 period. A 30-year period was chosen as long enough to dampen out extreme short-term variations, but also not so long as to disguise changes over time. The use of a standardized climatological normal gives a common benchmark against which conditions can be compared. This is not only in the context of whether a given day or event is “normal” but also whether there are shifts in conditions from one climate normal period to another. Certainly, other metrics like the average over a locations entire period of record (POR) or the average of the most recent 20 years can and are used. But the standardized “normal” period give a common point of reference. And it does make a difference! For example, looking at the historical rainfall record for San Francisco, it can indeed be seen that there have been some decided differences in our point of reference. 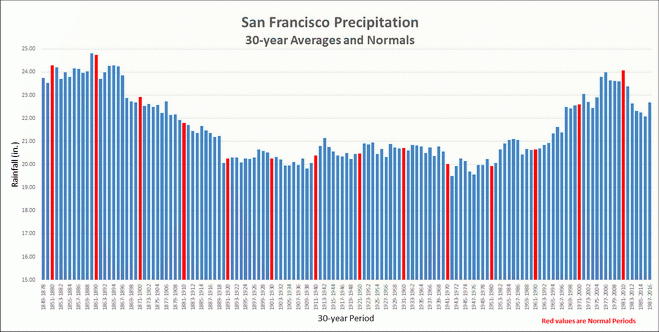 The current normal (1981-2010) annual rainfall in San Francisco is 23.65 inches. Even compared to the previous normal period (1971-2000) there was a significant difference; with a 6% increase from previous normal of 22.28”. The table below shows the variation in San Francisco’s 30-year averages, with the normal years highlighted in red. The highest 30-year average was 24.81” for the 1860-1889 period, and the lowest was 19.51” in the 1942-1971 period. A snapshot of California key city precipitation and temperature normals can be found at http://ggweather.com/normal/ with data for over 9800 United States locations at http://ggweather.com/normals/. For more complete normals see https://www.ncdc.noaa.gov/cdo-web/datatools/normals.